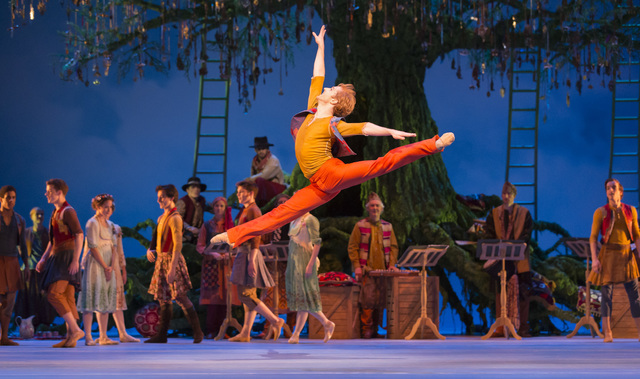 The Winter’s Tale is one Shakespeare play that has until now never been turned into a ballet. Choreographer Christopher Wheeldon, however, saw its potential and the result is an amazing new work for the Royal Ballet that should go on to become a mainstay of its repertoire. The story explores what happens when King Leontes of Sicily unjustly accuses his wife Hermione of being unfaithful. Most of his family die of grief, and his daughter is left abandoned on the Isle of Bohemia. All this generates strong drama as Leontes’ accusing finger points to more and more people in defiance of reason, but the tale also has the potential for lighter and more exuberant moments as from the midpoint onwards new love blossoms and the King strives to make amends. The original story is skilfully, and only slightly, altered to work for the predominantly visual medium of ballet. In the play Leontes’ final reunion with his daughter is reported rather than shown because such an intense scene was best left to the imagination. Here, in the absence of words, the moment is necessarily and sensitively captured. Indeed, an emerald is introduced to the plot that enables Leontes to identify his offspring. Wheeldon’s choreography is brilliantly innovative as it is utilised to convey the madness of a King. As Leontes roughly yanks Hermione around we see an inversion, even perversion, of the traditional pas de deux. At the same time, the introduction of young lovers in Act Two allows for more lyrical dancing while the intoxicating sheep sheering feast reveals Wheeldon’s genius in designing images of such swirling intensity down to the very last detail. The sets vividly portray snow, sea, storms and clouds while an iconic painting by nineteenth century German artist Caspar David Friedrich also appears to good effect. Joby Talbot’s music successfully combines the modern with a certain ‘Renaissance folk’ style, which feels entirely appropriate for a tale whose messages of forgiveness and renewal transcend the ages. Edward Watson as Leontes proves the most brilliant psychological dancer, while Lauren Cuthbertson as Hermione brings great character to her smooth technique. Steven McRae and Sarah Lamb are a dream partnership as the young lovers, Florizel and Perdita, Zenaida Yanowsky is on fire as Hermione’s Head of Household while Federico Bonelli is strong and spectacular as King Polixenes of Bohemia. The ballet also benefits, like the play, from not ending with a scene of mass celebration, and by actually honing in on one ‘transgression’ that can never be reversed. The evening feels all the stronger for reminding us of the fragility and transient nature of life, but it is ultimately one that leads our hearts to rise. Until 8 May (eleven performances) at the Royal Opera House, Covent Garden, London WC2E 9DD with start times of 12.00 and 19.30. Casts vary over the run. For further details and tickets visit the Royal Opera House website. The Winter’s Tale will be broadcast live to cinemas worldwide on 28 April 2014. For full details of participating venues visit the Royal Opera House Live Cinema Season webpage. Londonist received a complimentary ticket and programme from the Royal Ballet press team.